A couple of years ago I took a drive on a summer's evening down Highway 3 to Northfield. As night fell, I found myself on the south side of town at the County Road 1 turn-off towards Dundas. Having never seen Dundas before, I decided to get off the main highway and do a little exploring. As it turned out, I had stumbled upon a small piece of Minnesota highway history: a surviving piece of old State Highway 1, which had once been one of the most important routes through south central Minnesota in the early days of automobile travel. I continued south into old downtown Dundas, past the ruins of a couple of old mills, and then out of town on County Road 8 into the countryside. By this time night had fallen, and I was alone on the old narrow highway. After a few minutes, I saw the railings of a small and ancient highway bridge in my headlights. I sped across the span with barely enough time to get a good look, promising myself that at some point in the future I would return to capture the old bridge in photographs. Fast forward to the spring of 2008. On a whim, I was perusing a list of the state's bridges over 20 feet in length released by MnDOT after the 35W bridge collapse. Remembering the old bridge, I found it in the list (bridge 5742 over Wolf Creek, constructed in 1920), and not surprisingly, found it to be rated "structurally deficient". 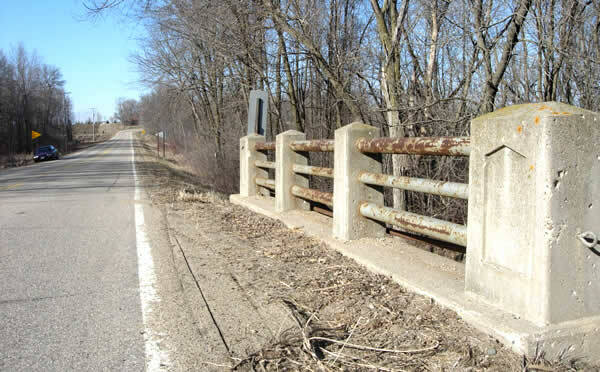 I knew that similar bridges were slated to be replaced soon in Winona County on old alignments of U.S. 61, so I went over to the Rice County Highway Department's web page to see if a similar fate was to befall the old bridge near Dundas. It became clear that the bridge didn't have much time left: it was slated to be replaced this year! (link opens to a pdf map of 2008 construction projects in Rice Co) A couple of days later I headed down to Dundas to visit the bridge one last time before its imminent demise. Traffic was practically non-existent on County Road 8 on the friday afternoon I visited the old bridge. A weight limit of 9 tons had been imposed on the structure, complete with red warning flags (DANGER! DANGER!, see photo below). Looking north on County Road 8 at the old bridge over Wolf Creek, March, 2008. Although the bridge definitely looked aged, it didn't quite match up stylistically with other bridges from the 1920's I had seen recently, which usually had solid concrete rails. 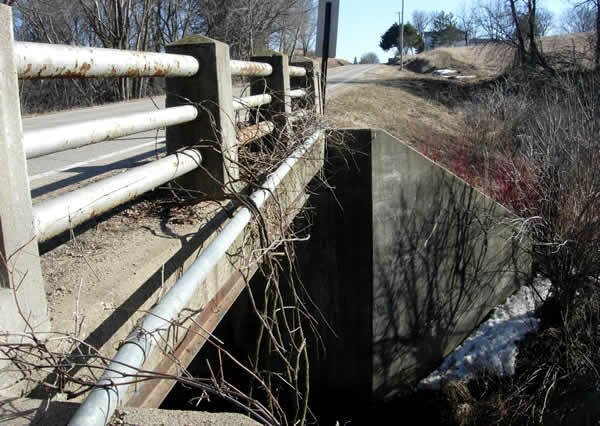 This bridge had an almost moderne design, with concrete piers connected by metal railings (see photo below). A closer view of the concrete and metal railings. The plot thickened when I saw the dedication plaque (photo, right). 1936?! The bridge list had given a construction date for the bridge of 1920! When I got home, I reviewed the construction project log for control section 6612 (now State Highway 3) and the original highway plans for the grading and paving of the old highway through Dundas. The construction plans, dated 1920, showed that a bridge (#1046) was already in place over Wolf Creek, and that it was to be raised and widened as part of the project. Sadly, it appears that the bridge plans for both bridges 1046 and 5742 have been lost (they were not available electronically from MnDOT). A better clue came from the construction project log, which showed roadside development being conducted along the highway near Dundas in 1936, along with the widening of bridge 5742 in 1937 and some paving over of the old concrete with a bituminous surface in spots, including at the bridge. 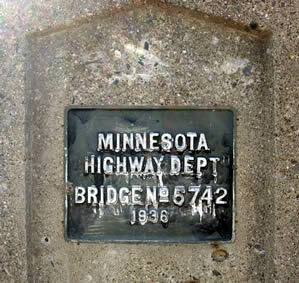 This seems to indicate that the deck of the old bridge was either replaced or widened in 1936 or 37, and that the concrete and metal railings were probably installed at that time. It is still unclear whether all parts of bridge 1046 were removed and replaced in 1920/21, or if the bridge was simply renumbered when it was widened in 1936/37. Another view of the bridge, showing the steel support beams and concrete abutments. In any case, all indications are that the bridge will be gone by the end of the year. Although the road appears to be used lightly, the recent moving of College City Beverage to a new facility on County Road 8 just north of the bridge (see an interesting blog on the subject of CCB's decision to move to Dundas here) probably made the replacement of the bridge necessary. The way the local roads are currently configured, the heavy beer trucks have to travel directly through downtown Dundas and a residential neighborhood to reach Highway 3. 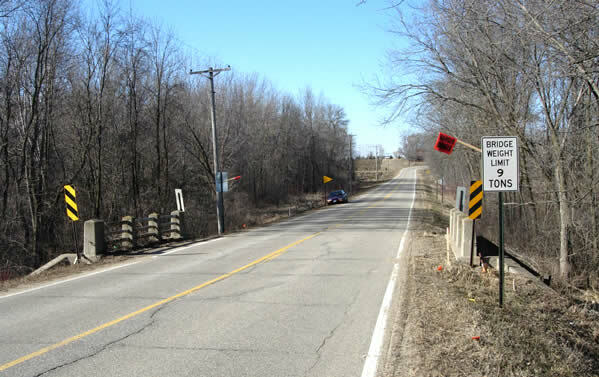 A better bridge will allow the trucks to travel directly south to Highway 3 on their way to Faribault, bypassing Dundas and Northfield altogether.